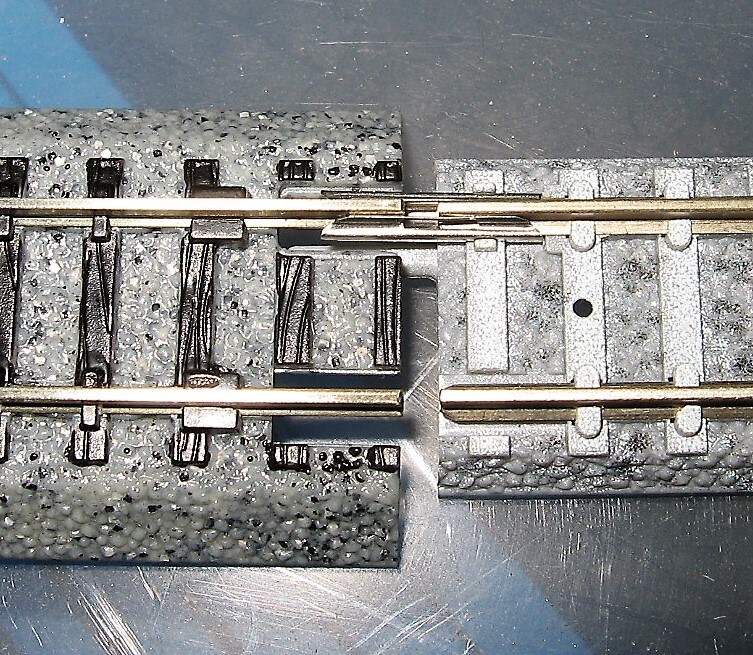 Has any Kato Unitrack user mixed in Tomix finescale track pieces within their layout? Are the two systems comparable in the same way as Peco's Code 80 & 55, or are there other issues? I'm considering using the Tomix 3 way and maybe their curved points, although expensive and would have to be order through Plaza-japan's eBay shop. Tomix and Kato rail joiners are on the opposite sides for a start! Both code 80 rail. 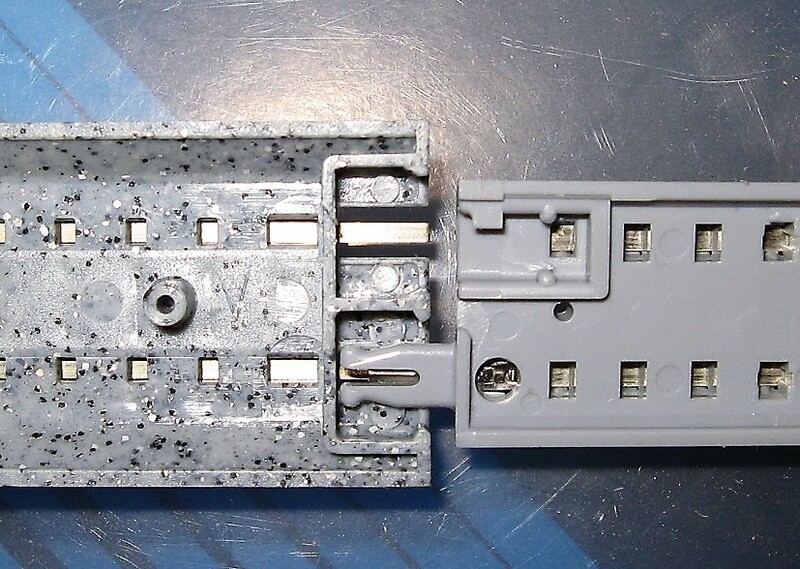 If remove the Unijoiner then the Tomix rail joiner will fit the rail section, but the plastic clip on the end of the Tomix prevents full engagement so you'll need to cut that off. 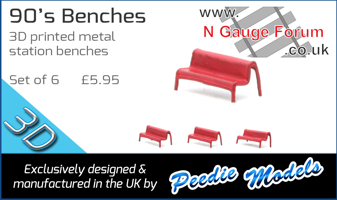 Of course you'll also need rail joiners to replace the removed Unijoiners. Can you get packs of Tomix joiners? Otherwise maybe Fleischmann will fit? Peco definitely not. 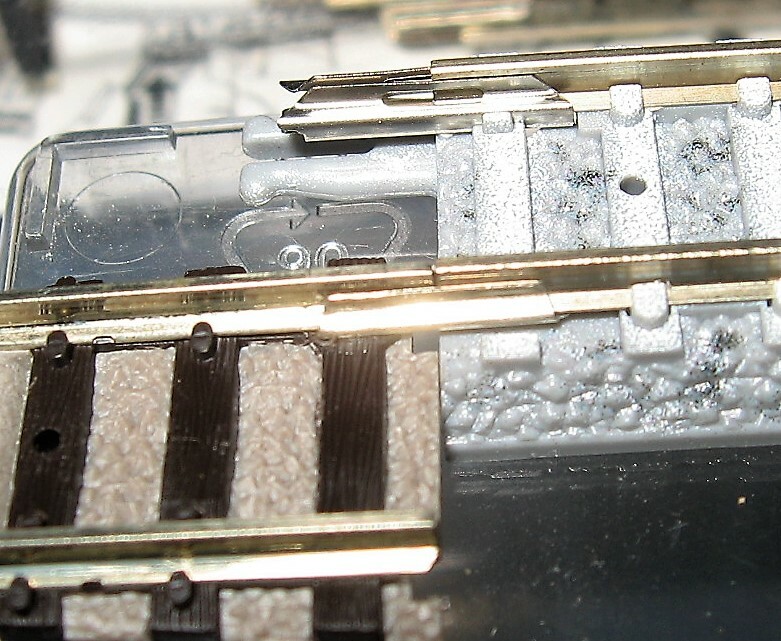 Kato provides an adapter track piece (part number 20-045) which accepts Tomix track, though that might not be practical for mixing track pieces at will, particularly points. I did at one point have a setup which was part Kato, part Tomix but gradually transitioned to Tomix, and only use Kato track for hidden storage sidings. Thank you very much for your responses, particularly the photos highlighting the problems between the two systems. Although I'm beginning to think I might have to rethink my planning, one further question please, Do the Tomix points also have the point motors build in like the Kato points? Do the Tomix points also have the point motors build in like the Kato points? I get the impression they do but @railsquid will know. the vibro-massage unit is fab! Correct, actually the "motors" are little rectangular units which are removeable (also available as dummies for manual-only point control). I think curve radii and point geometry are different as well. Yup. 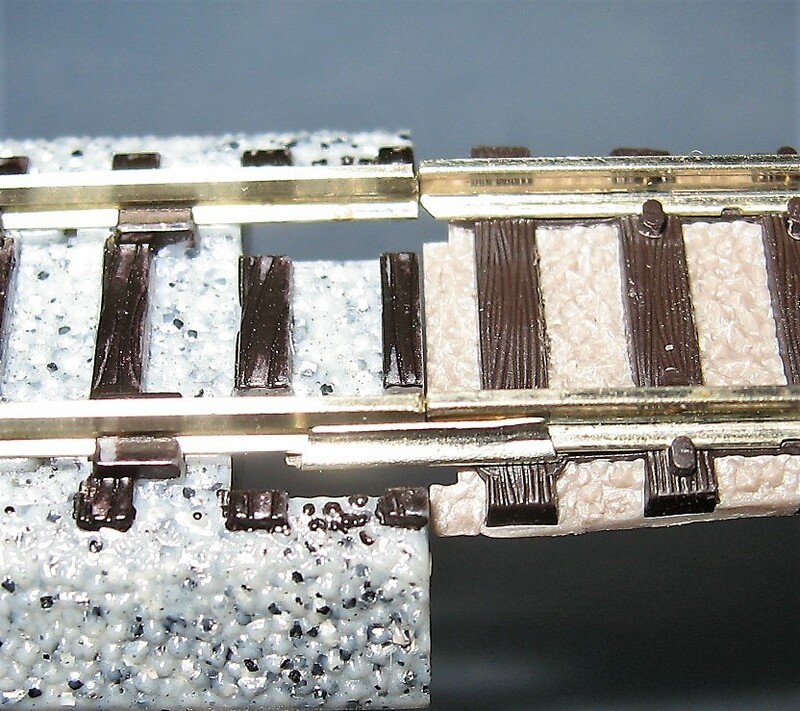 Also track spacing (Kato: 33mm; Tomix: 37mm). While the issues that have been highlighted can probably be overcome, alas I think I'll surrender any plans I had to mix Tomix & Kato track systems . One of the reasons for converting my layout from Peco to Kato is for less stress with the ability just to watch trains go by with the appropriate drink in hand, the idea being is to de-stress. Thanks One and All for your input. Kato Unitrack is also readily available - Tomix main european dealer appears to be DM_Toys (De) Tram track only - a very good shop though. 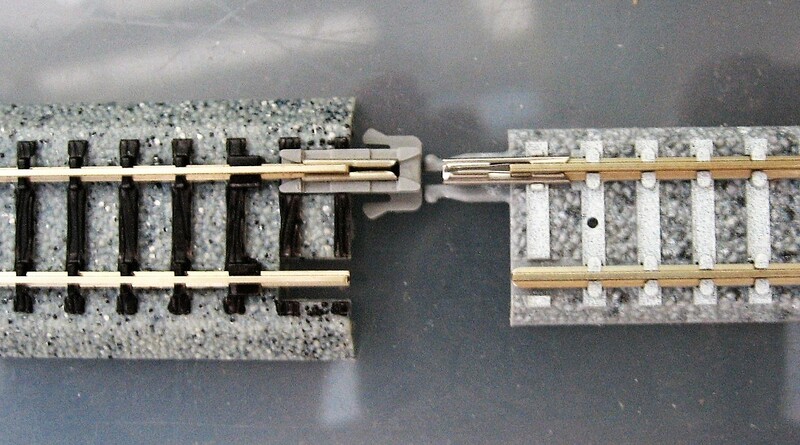 I don't whether this is of help at all, but I have two Tomix double cross-overs on my Peco streamline layout, and have successfully used Gaugemaster rail joiners for joining the two. 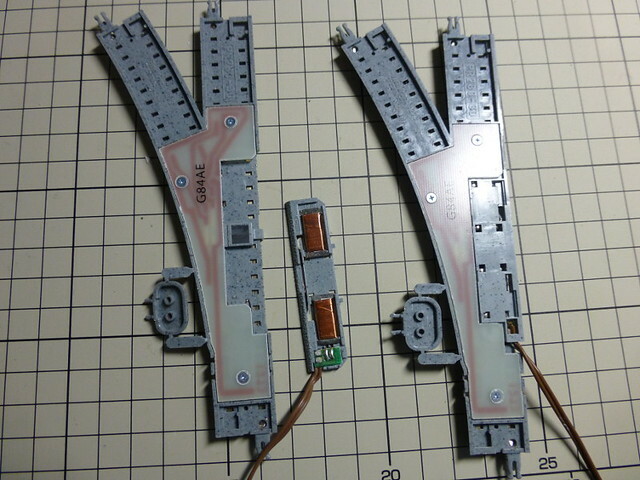 The Gaugemaster ones are slightly bigger than the Peco ones, and fit the tomix track much better, after of course removing the tomix joiners.